The sixth morning was a bit melancholic on our cruise. It was the beginning of the last full day on the ship. Nevertheless, it was a day with another great place that we were about to visit. 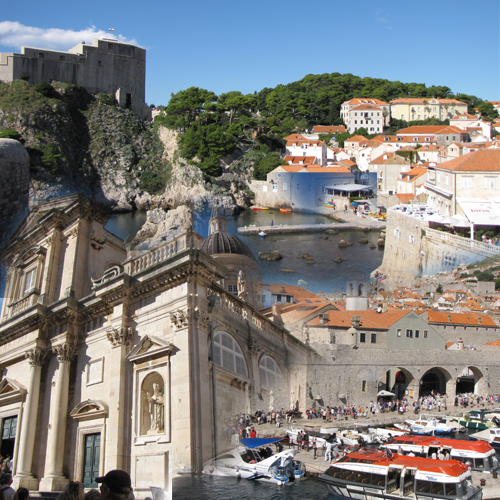 The destination for this day was Dubrovnik, one of the nicest coastal cities of Croatia. We did not book ahead to any trip in Dubrovnik, we figured, that if the ship is docked, we can explore the city on our own. Boy were we surprised, when we learned, that we are going to be just anchored next to Dubrovnik, using the ships life-boats as tender service to the shore. Luckily the tender service was free of charge, we just had to sign up for a ticket for one of the boats leaving at specific intervals from the ship to the old port of Dubrovnik. In order to get one of the tender-boats leaving at a reasonable time, we had to stand in a HUGE queue (apparently everyone thought it was a good idea not to book ahead in Dubrovnik) and sign up early to them (I was up at 6:30 to get in line before opening time and the queue was already huge). I was targeting the tender leaving at 9:00 but I was not really sure if I was able to catch a ticket to that, because I was quite at the end of the queue… To my surprise I did: apparently the tender-boats were large enough to accommodate a lot of people at once (120 to be more precise). So, I happily went back to our cabin with a big smile having a job well done (well, the queue actually got even bigger after I left, so my timing was not so bad after all), waving the tickets victoriously: we had time to have our breakfast in a reasonable time and get to the shore calmly 😉 . Since day one I was curious about how the life-boats look like from the inside. I did not want to find out the hard way (that would have meant that ship has gone “titanic”), but still I wanted to find out. So, I was actually quite excited about the fact that we were about to use them. When we got in I found out, that it was much bigger than even the tender boat we used in Santorini (it’s maximum capacity was 150! people). The ride, which took us ashore was also quite fun: the boat was going with relatively high speed and when it hit the wave of one of the returning boats it went into some fun up&down shaking waking everyone up if they did not wake up, yet 😉 . The boat ride took a few minutes during which we passed some of the local boats as well as the life-boats of another cruise ship anchored quite dangerously close to the shore (yes, it was a Costa ship 😉 ). With tourists coming from two cruise-ships at the same time into the already quite crowded city, the outlook for the day was just great 😉 . After getting ashore right next to the old city wall, we already faced a quite large crowd of tourists heading into the city. Well, we decided to follow the flow and try and not get lost 🙂 . The flow took us through the main street of Dubrovnik, right trough two churches, a few gift shops, until we arrived to one of the entry points to climb on top of the city walls. A lot of the photos of Dubrovnik were views from the top, so there had to be something special up there… We decided to pay the price of 100 Kunas (~€12.00) per person and climbed the stairs leading up to the top. Well, there were a bit fewer people on top than down on the streets, but then again, the path was also narrower. There was a lot more air, so that was definitely better, but the real wow effect was the actual view of the city and the sea from there. It was absolutely fantastic. I could not stop taking photos, and neither could others, making the flow of people on the walls quite slow, which in turn meant that it was going to take quite some time until we walked around the entire historic center following the walls. There are two points where we could have come off, but we decided to do the entire circle, spending about 2-3 hours on the top. This time was about enough of the city and we decided to head off, because there seemed to be quite a long queue at the tenders returning to the ship. We basically followed the same route to get back to our tender after we got off the walls, so we quickly found the way back to the port, but there the queue got so long that we barely just got through the main gate and we already had to stand in line in one of the queues (yes, there were about three). Here every culture brought its best in showcasing their way of standing in line. I was especially proud to see the Italians just pushing their way all the way to the front, but hey, I lived enough among them not to expect any miracles here 😉 In any case, the tender service got everyone back to the ship in time and nobody was left ashore. We even could have a quite decent lunch without too much running around to find ourselves a place to sit down 🙂 . I have uploaded a few photos here. This entry was posted on Wednesday, October 15th, 2014 at 8:38 pm	and is filed under Croatia, Travel. You can follow any responses to this entry through the RSS 2.0 feed. Both comments and pings are currently closed.